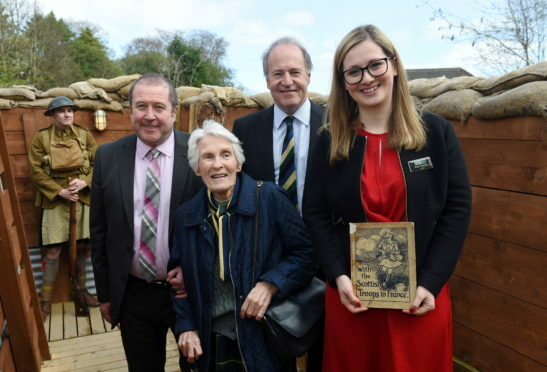 L-R: Graeme Dey MSP, Dr Margaret Moffat, Charlie Sloan (Chairman), and Ruth Duncan (Curator) at the official opening of the Moffat Trench at the Gordon Highlanders Museum in Aberdeen. A 100-year-old book written by a wartime correspondent for the Press and Journal’s predecessor has been donated to the Gordon Highlander’s Museum. With the Scottish Troops in France was penned by Alexander Catto, of the Aberdeen Daily Journal, in 1918 and details the heroics of servicemen and women. It was found in a jumble sale, and given to Veterans Minister Graeme Dey. Yesterday Mr Dey handed the book, which originally cost one shilling and a sixpence, to the museum at the official opening of the attraction’s new First World War replica trench. He was joined at the ceremony by Margaret Moffat, who cut the ribbon of the trench which has been named in honour of her father, Lieutenant Colonel Francis Moffat. Lt Col Moffat was awarded the Distinguished Service Order (DSO) for his actions in the 8/10th Battalion on August 30, 1917, during the Battle of Ypres. Ruth Duncan, curator of the museum, said: “The trench has already made a fantastic contribution to the visitor experience at the museum, and will continue to be for this year of the centenary of the end of the Great War, and many years to come. “There are now no living veterans of the First World War so it is now more important than ever that their stories are told and safe-guarded for future generations. Graeme Dey MSP and Ruth Duncan with the book, “With The Scottish Troops in France”. Mr Dey added: “It has been a pleasure to assist in opening the Gordon Highlanders museum’s newest attraction. “This recreation of a First World War trench will provide a great way in which current and future generations can learn about, and experience for themselves, what the young men of the Great War went through whilst serving on the Western Front.